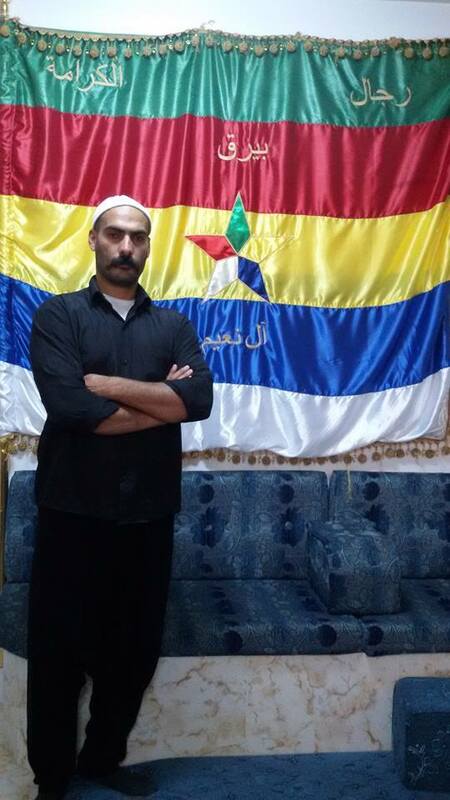 Last month at this site I profiled the main new Druze militia factions that have emerged in Suwayda province and how they are competing for influence: on the one hand, the clearly pro-Assad Dir' al-Watan led primarily by Sheikh Jerbo and Nayef al-Aqil, and on the other hand Sheikh Abu Fahad Waheed al-Bal'ous' faction Rijal al-Karama, whose aim could be characterized in short as critical of the regime but not desiring to overthrow it, seeking instead islah ('reform') of the system. Until now, both sides have continued to court locals in various parts of the province in a bid to build support, with Dir' al-Watan working alongside already existing pro-regime factions in Suwayda such as the Syrian Social Nationalist Party (SSNP). The main backers of Rijal al-Karama have been Druze living in Israel and the Golan, though connections with the state of Israel are denied. Neither Rijal al-Karama nor Dir' al-Watan appears to have given any credibility to Lebanese Druze leader Walid Jumblatt, who has continued to urge the Druze to join the uprising against the regime. 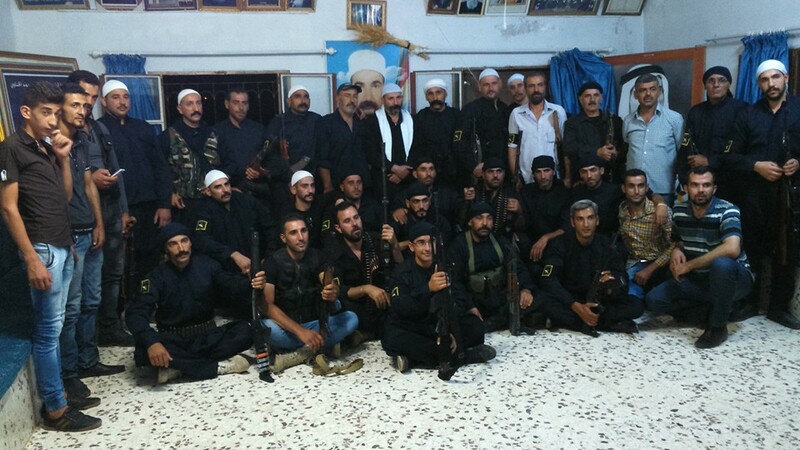 One of the last known media releases featuring Bal'ous (from 1 September), with members of pro-Bal'ous militia Bayraq al-Basha. 22. Hussein al-Shariti's wife, her daughter and grandson. The immediate question raised by the bombings is the identity of the perpetrators. 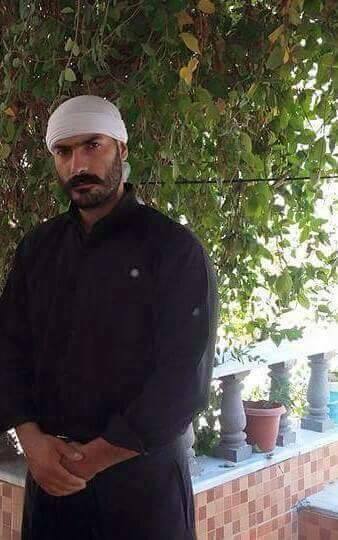 One suspect is clearly the regime and its supporters in Suwayda, many of whom undoubtedly resented Bal'ous and the noticeable growth in his influence over the past few months, as an increasing number of Druze militia groups congregated under his personality and banner, such as Bayraq al-Basha, Bayraq Al Nu'aim (Bayraq al-Nidal) and Bayraq al-Haq. As far as names of the victims go, there can be no doubt the targets were political: that is, aimed at Bal'ous and some of his key followers in the province. Note for instance how many of the names are from the Nu'aim family. Sheikh Fadi Nu'aim in particular is to be noted for his role in Bayraq al-Nidal/Bayraq Al Nu'aim ('Banner of al-Nidal/the Family of Nu'aim). Fadi Nu'aim: in my previous article, note his appearance in the photos featuring rallies of Bayraq Al Nu'aim and similar militias. Fadi Nu'aim in front of his militia's banner. However, at the present time, no significant pro-regime personalities in Suwayda are celebrating the bombing, but rather condemning it as a terrorist attack- a clear attempt to cool tensions and prevent fallout. Thus, Sheikh Hamoud al-Hanawi, who is also an important figure involved in Dir' al-Watan, issued a condemnation, affirming that "the targeting of peaceful innocents comes from the nature of black terrorism that has no homeland and religion and has no affiliation with state and human principles and laws, except the culture of killing and destruction." 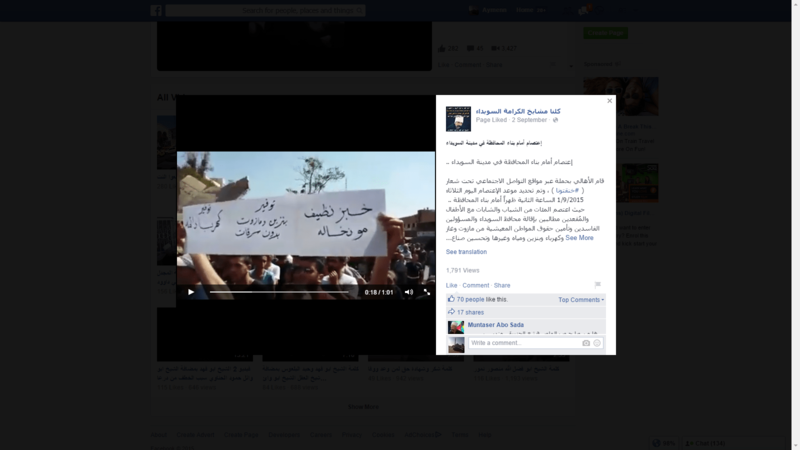 Prior to the bomb attacks, Suwayda has most recently witnessed anti-corruption protests, with anger directed at the governor of Suwayda Atef al-Nadaf, including chants like "The people want the downfall of the governor." For example, one popular grievance in Suwayda involves corruption in the smuggling of oil and other related products, as well as poor provision of basic commodities and public services like bread and electricity. "What are the reasons for the cutting off of the Internet from Suwayda province for more than 2 days and the cutting off electricity for more than 10 continuous hours after citizens came out in peaceful demonstrations raising the Syrian Arab flag, and their slogan in the sit-in: the bearing of any types of weapons is forbidden? Were it not for Suwayda, Syria would have been a French colony. Were it not for Suwayda, Syria would have been Da'eshi [i.e. wholly taken over by the Islamic State]. We are with the homeland and with the Syrian Arab Army and under the Syrian Arab flag possessing green eyes. So don't test the patience of Suwayda because the people of this province are a people of nobility, manhood and hospitality who do not accept humiliation or bowing down to any person, whoever he is. We request that no order be implemented to enrage the citizens and the street in Suwayda because the citizen body has reached the end of its patience and has not been able to re-secure the most basic of things for daily life and livelihood. Was the Internet cut off out of desire to prevent the arrival of photos and the events that happen in the sit-in for expats of the sons of Suwayda province or social media sites? We hope this problem will be resolved as soon as possible with as few losses as possible if God wills." 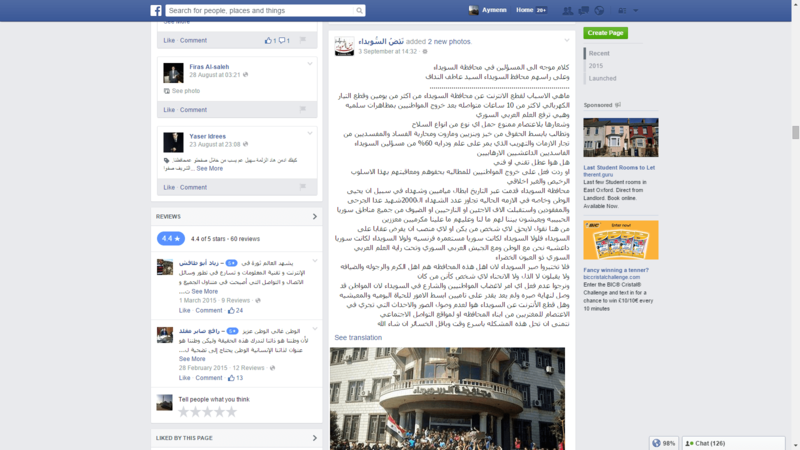 Other pro-regime pages whose raison d'etre has been opposition to Bal'ous accused Bal'ous and his followers of orchestrating the demonstrations as part of a prior agreed plan to destroy the regime in Suwayda through collusion with foreign intelligence and Jabhat al-Nusra, as per below (though the page in question, entitled "All of us together against Bal'ous" has since been deleted following on from his assassination). 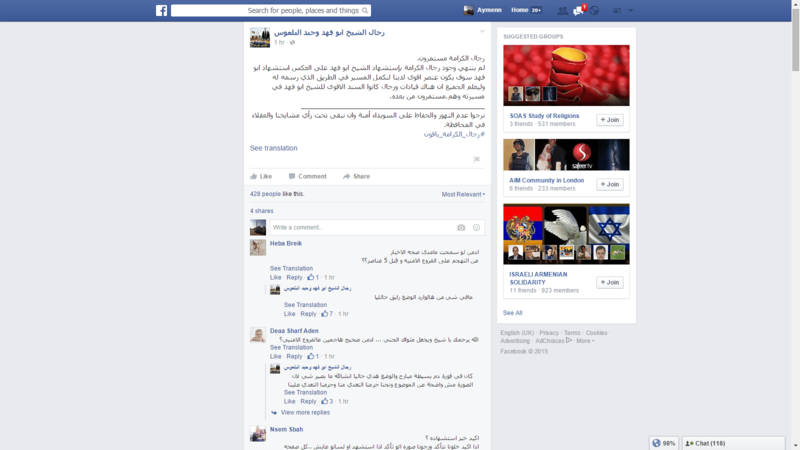 * Amusingly, a rather excited professor from King's College London proclaimed to me in July how the King of Jordan was privately boasting of plans somewhat similar to what this page claims against Bal'ous: that Druze sheikhs had reached an agreement via Jordanian mediation to overthrow regime authority in Suwayda and allow the opposition to take control, which would allow the King to send Syrian refugees in Jordan to Suwayda. "The Rijal al-Karama continue. The existence of Rijal al-Karama will not end with the martyrdom of Sheikh Abu Fahad but on the contrary the martyrdom of Abu Fahad will be a more powerful motive for us to continue the route on the path that he outlined for us. And let all know that there are leaders and men who were the strongest support for Sheikh Abu Fahad in his life and they are continuing after him. We ask you not to be rash, to keep Suwayda safe and that we remain under the opinion of the our mashayakh and learned ones in the province. #TheRijalalKaramaRemaining." This is to be contrasted with more excited calls and pronouncements from opposition supporters that the 'revolution' has somehow come to Suwayda. The groupings aligned with Rijal al-Karama are known by name and so far there is no reliable indicator of calls from Rijal al-Karama and its constituents to overthrow the regime in Suwayda. The foremost problem with envisioning such a goal is that the clearly pro-regime factions in Suwayda are still present and cannot be done away with overnight. Were calls for escalation to come about, it could lead to the worst case scenario of a full-blown, bloody intra-civil war in Suwayda province, leaving the region even more vulnerable to encroachments of the rebels from the west and the Islamic State from the east and north. The situation remains tense, and the regime may be forced to concede even further autonomy to Suwayda province, but one needs to consider what a call to taking up arms and 'revolution' would actually mean in this context. 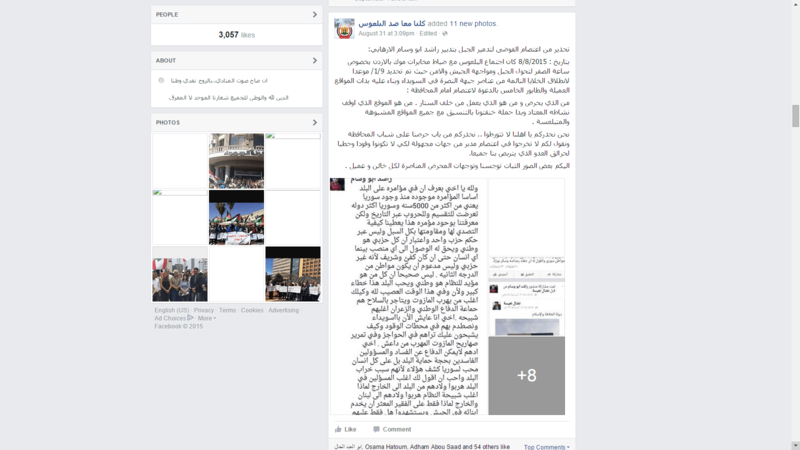 * [Update 19 April 2016: After disappearing in the wake of Bal'ous' assassination, the page reappeared on FB but has not posted since January 2016].